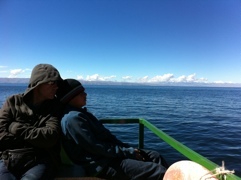 We took a daytime tour-bus from Cuzco to Puno. Since service had just been restored a day before, people were still wary of travelling to Puno and thus our bus was almost empty. It was very expensive but we figured the tour would be worth it. Our first stop was Andahuaylillas where we visited the Church of San Pedro, an example of what is called “pan de oro”, literal translation: gold bread. 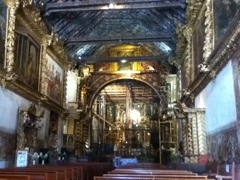 It is the technique used to cover the wood pillars with gold. 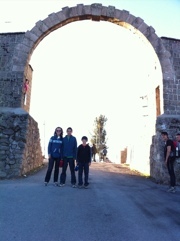 Our next stop was Raqchi. 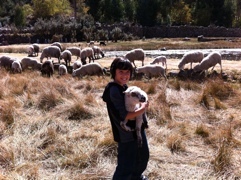 Here we found a very good small crafts market where Fernando bought a very ugly knife and Ale played with baby sheep. 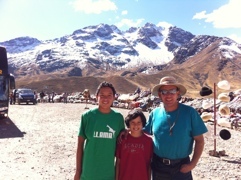 We then stopped at “Abra la Raya” which is where the sacred river, Vilcanota, is born from the snow on the Andes. 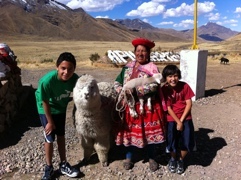 It was also the highest point on our route: 4338mt (14231ft) and the boys got to pet a baby alpaca for a few soles. 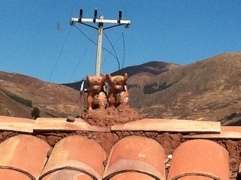 Next was Pukara, allegedly famous for its ceramic bulls which are placed on top of houses for good luck. The bulls are cute but an entire museum dedicated to them? You can probably tell that by now we were getting the impression that this tour was nothing more than another peruvian ruse to extract money from turists. After this, we were stopped on the road for almost an hour due to construction! 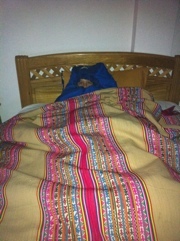 When we finally got to Puno we were terribly tired. We got a good deal on a hostel for the night, I think because tourists had stopped visiting due to the protests. 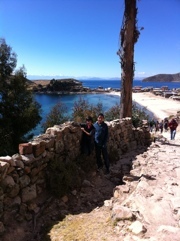 Puno is set by Lake Titicaca, highest lake in the world at 3841mt (12601ft). Tours to the floating islands of the Uros start here but we decided to pass and after having a good look at the lake, took off towards Bolivia. 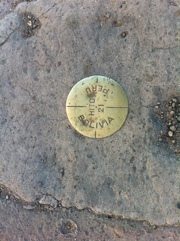 Crossing the border meant first getting our exit stamps from Peru, walking across to the Bolivian side, getting our entry stamps and then getting back on our waiting bus. It didn’t feel scary at all but then again we did it during daytime this time around. 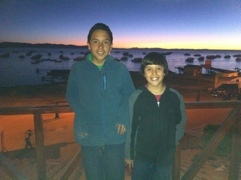 We finally got to Copacabana, Bolivia that night and found a great, cheap hotel right on the lake. We got a room with a huge balcony and an amazing view. We were all thrilled about it until that night when the temperature dropped so low we had to sleep in our sleeping bags with the covers on top! The hotel advertised as having heat in every room but we found out that heat meant that they would lend you a space heater if you were lucky and savvy enough to ask for it before the receptionist left for the night. Too bad for us. The next morning we took a boat tour to “Isla del Sol” which the legend says is where the Inka god Viracocha emerged from the waters and created the sun. The boat ride took three excruciating hours. 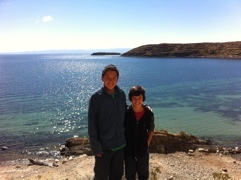 At the island are a few ruins and some hostels. The ruins aren’t really much to look at but the views from the island are gorgeous. It took another three excruciating hours to get back. At least we had the Andes on the horizon to cheer us up. 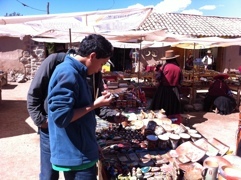 If we had to do it again, we would have skipped the boat tour and instead spent the morning having a relaxed brunch at one of Copacabana’s many small restaurants and enjoyed the views of Lake Titicaca and Andes before getting on the 1:30pm bus bound for La Paz. Since we didn’t, we got back to Copa at 5:30pm to find that the tickets we had bought that morning for the 6:30pm bus to La Paz were useless since all service had been cancelled. Why? Protests and roadblocks of course. We waited, along with many other tourists, because some agency operators said that service would resume soon. We were finally able to get on a bus around 7pm with the reassurance that although the roadblocks hadn’t lifted yet, they would probably be gone by the time we got there. What nobody tells you is that you will have to get off the bus at Tiquina, buy a ticket for a ferry which will get you across a strait of the lake and then get back on the bus (which also crossed on a barge) on the other side. It didn’t feel unsafe but it’s always scary when soldiers stop your bus, order everyone off and give no other instruction until like sheep we all followed the one bolivian passenger to the ferry. Doing all of this during daytime must be tons nicer and the views must be better. A piece of advice for solo travellers: make friends with someone on the bus and use the buddy system. Our bus driver got on and took off without doing a head count, if someone was left behind in the confusion created by having several buses doing this at the same time, we won’t ever know. We got to La Paz at midnight and since we were running late, the bus driver decided not to go to the terminal and instead dropped us off at the cemetery, the seediest part of town. We hurriedly got our stuff, flagged down a taxi and went to a hostel where we had reserved a room. When we got to the hostel, the receptionist decided not to rent us a room because it was too late and he had already closed the register for the night. Talk about small-mindedness! He put us out on the street and locked the door behind us. We got another cab and drove to a hotel without knowing if we were going to get a room or not. We were very lucky, first because although we had been advised not to flag down taxis, specially around the cemetery area under risk of being kidnapped, we had no choice but to flag down two and survived; and second because we did get a room at a lesser price than the hostel would have been and even got a space heater for our room. Yipee!